To see a chapter heading, start on a new page, use the Keep Options panel for that style and select 'On Next Page'. This will create the right appearance and be good for PDF/Print. This is not all you need to do for the ePUB though. 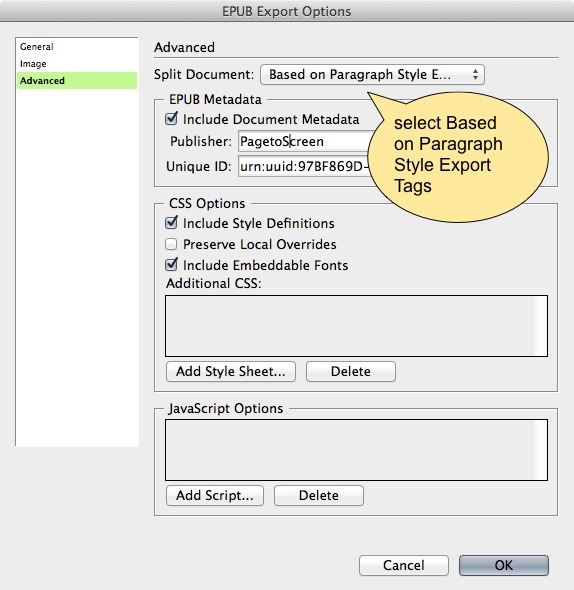 To get this heading to be at the top of a new page you will also need to use the Export Tagging panel and check the box Split Document. You do this for any heading style, so if you want the Scene change to start a page then check this also. There is still one more thing to do at the point of exporting to the ePUB file, and this is in the options for the export to ePUB panel. 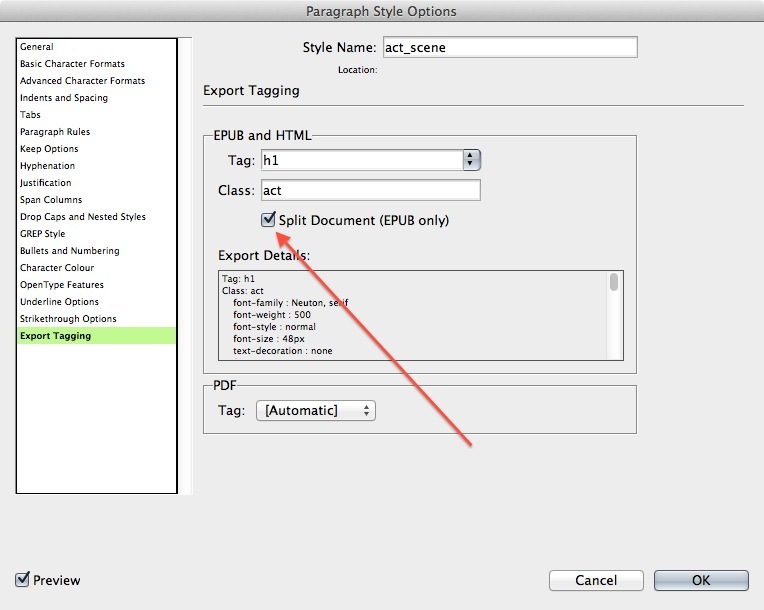 You need to tell InDesign to split the ePUB using the Paragraph Export tags settings. It is less certain that this method will always work on some devices, so the most guaranteed method is to break the ePUB into separate HTML files using the method above. If you want to have the chapter heading (maybe with a picture or chapter summary), on a page by itself, then the first paragraph after the chapter heading also needs to be a unique style that can have the 'break ePUB' switch, so that a new page is created at this point also. There is still one more option that will influence page breaks in the ePUB from InDesign and that invloves using the book panel. For very large books with many chapters, book designers may be using the book and working on separate chapters with the book. When you export to ePUB from the book panel, each chapter will automatically create a new HTML file. 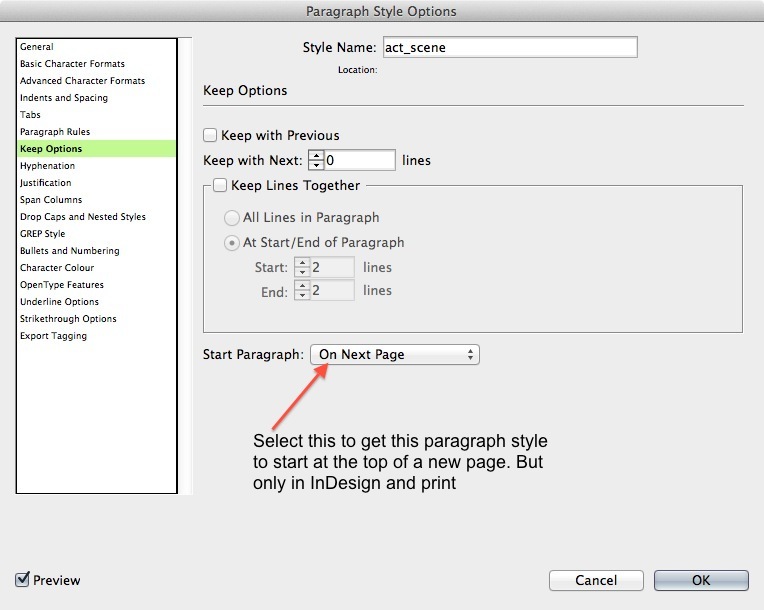 Currently InDesign CS6 does NOT further break up the ePUB file from styles within the chapters, so you are stuck with just the break at the new chapter.